Originally formed in 1980, Flowrite is today one of the foremost damper manufacturers in the world. With a policy of continuous development, our range is always up-to-the-minute in design, manufacture and operational reliability. Using up-to-date 3D CADsoftware, we can model customers’ bespoke damper requirements to ensure damper designs take into account both overall strength of construction and, just as importantly, vane deflection under simulated full load conditions. Quality manufacture is part of every Flowrite damper. Our policy is to ensure that the standard of equipment is commensurate with customer requirements. This is achieved by strict control of engineering and manufacturing from initial design to finial assembly and testing. Workshop testing is carried out to ensure all our dampers are fully operational and functioning as designed before leaving the workshop. 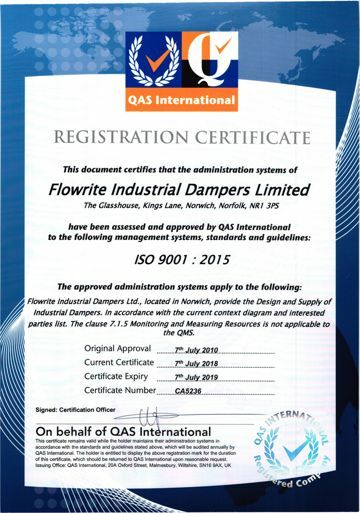 Flowrite is registered and annually assessed and certified to the ISO 9001:2015 management standards and guidelines for the design and supply of industrial dampers.